This Dairy-Free Blueberry + Lemon Float from The Whole Smiths is brought to you in collaboration with New Barn Organic Almondmilk. It is THE ULTIMATE summer treat. Paleo-friendly and packed with fresh flavors. It’s getting hot in herrrr’. Here it is, the middle of summer and it is hot, hot, hot. For some reason this summer has seemed hotter than most. I’ve lost count of the number of triple digit days, maybe I’m delirious from the heat? 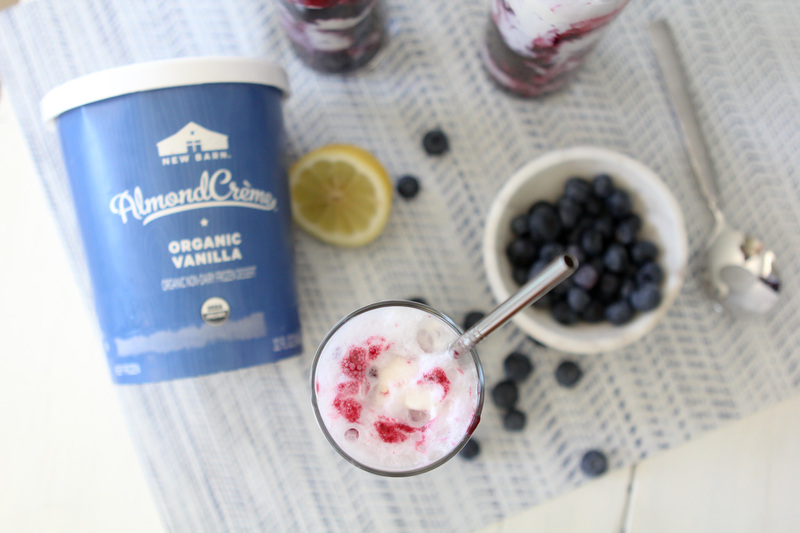 I wanted to create a frozen treat using New Barn AlmondCreme that would taste amazing, have clean ingredients and not be loaded down with sugar. While the hot weather doesn’t leave me with a ton of cravings, something cool and refreshing always sounds good. And since ice cream and summer go hand in hand, I’m always down. The truth of the matter though is that the treats that are cool and refreshing are often loaded up with a lot of junk and leave me feeling hot and gross. 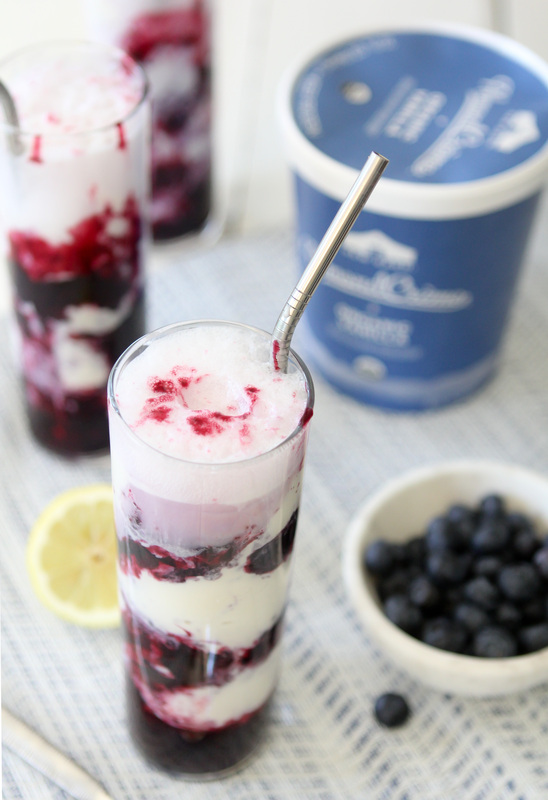 Enter my Dairy-Free Blueberry Lemon Float. I mean, I don’t want to say this little ditty was life changing, that sounds a bit drastic. But considering that the day I made it it was a solid 95* outside, I’m going to go with life changing. Before we get into how amazing this dessert is can I tell you how excited I am that New Barn has an almond based non-dairy ice cream made with their Organic Almondmilk that we can all enjoy? 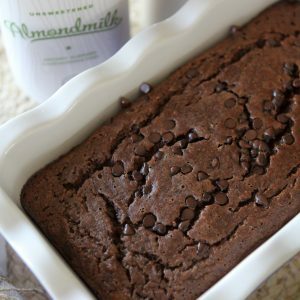 The taste and texture come from more almonds and simple ingredients, not added gums and flavors. Speaking of flavor, they have a large variety ranging from Organic Vanilla to Organic Banana & Chocolate Chip. All of their add-ins are super premium and come from producers like Allegro Coffee and TCHO Chocolate. Can I even say how amazing a good old fashioned chocolate milkshake would be with the Chocolate AlmondCreme and some Vanilla AlmondMilk? Mental note. 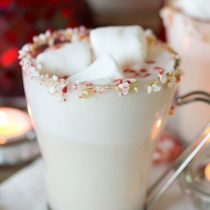 As I mentioned, I wanted to keep the ingredients simple and low in sugar. 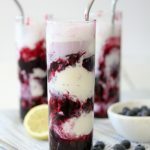 In lieu of white sugar I used honey and made sure not to overwhelm the blueberry compote with too much sweetness as I wanted the tart of the blueberries and lemon to pair against the sweet creaminess of the vanilla AlmondCreme. I wanted to create a treat that tasted special but would leave you feeling guilty that you indulged. One thing that I want to note is that I did use a bit of cornstarch to thicken up the blueberry lemon compote. I tried it with arrowroot as well and it works but I personally preferred the corn starch. The amount of cornstarch per serving is so minimal that it’s not something that I sweat. But if it is an issue for you, swap it out for some arrowroot powder instead. Most floats are made with some sort of soda and I don’t think this needed any more sweetness so I just used plain old sparkling water and it was perfect. I’m not going to lie, I wasn’t sure how that would turn out but like I said it was perfect. Using any sort of sweetened soda would have made it far too sweet for my tastes. The sparkling water was just perfect for this float. Without further adieu, here it is! Enjoy! A refreshing dairy-free dessert that is paleo-friendly, vegan and vegetarian. 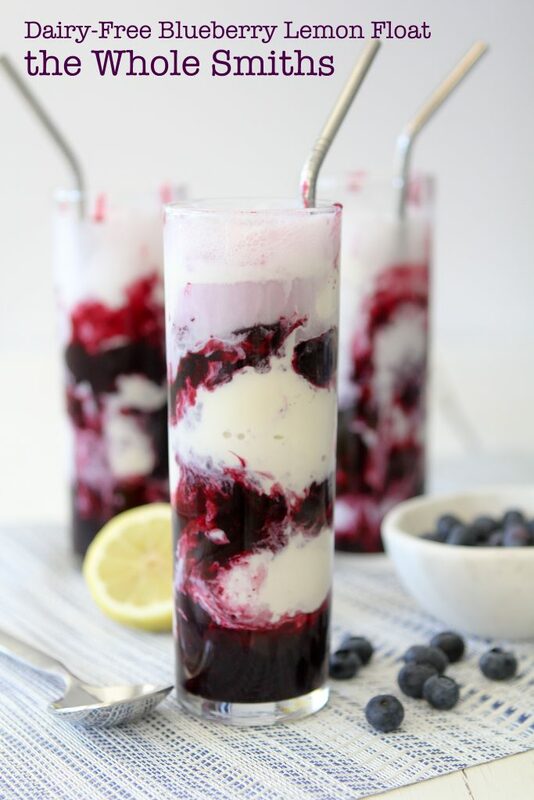 Using fresh blueberries and low in sugar, this is a dessert you can enjoy guilt free. Add the blueberries, honey, lemon juice, lemon zest and 1/4 cup of water to a saucepan and heat over medium-high heat, continuously stirring, until it starts to boil, about 4 to 5 minutes. In a small bowl combine the cornstarch and 1 tablespoon of water and stir until it is combined. 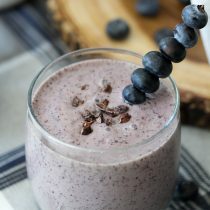 Slowly drizzle the cornstarch mixture into the blueberries while continuously stirring. 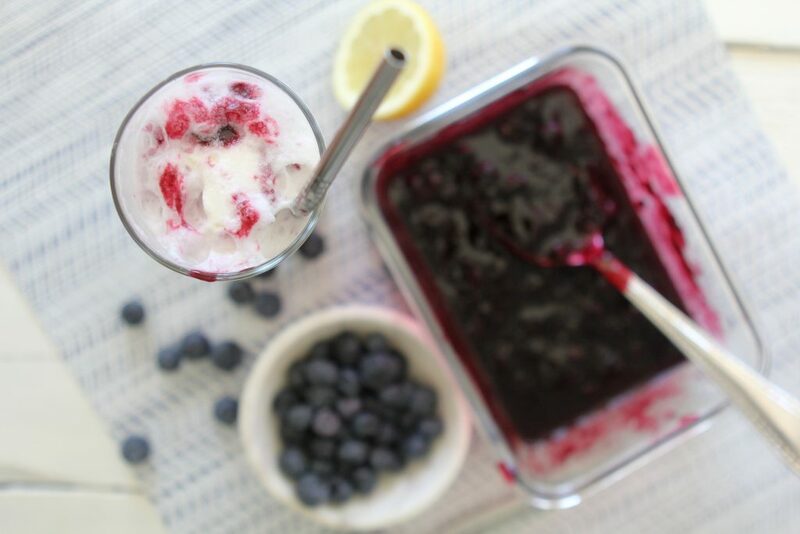 Remove the blueberry compote from the heat and let is cool to room temperature. 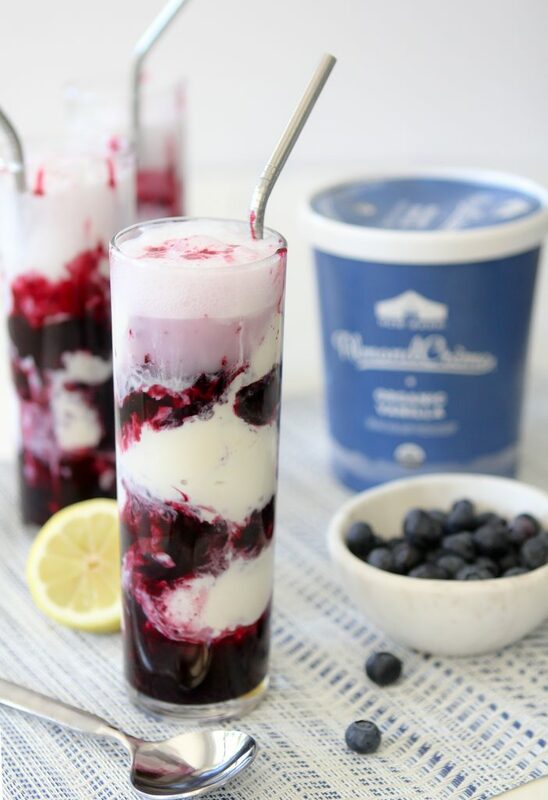 Once the blueberry compote has cooled, add a spoon of it into a glass and top it with a scoop of Vanilla AlmondCreme. Continue to layer the blueberry compote and AlmondCreme in the glass and top with a splash (or more to your liking) of the sparkling water.